Rescue of influenza A viruses from plasmid DNA is a basic and essential experimental technique that allows influenza researchers to generate recombinant viruses to study multiple aspects in the biology of influenza virus, and to be used as potential vectors or vaccines. Martínez-Sobrido, L., García-Sastre, A. Generation of Recombinant Influenza Virus from Plasmid DNA. J. Vis. Exp. (42), e2057, doi:10.3791/2057 (2010). Efforts by a number of influenza research groups have been pivotal in the development and improvement of influenza A virus reverse genetics. Originally established in 1999 1,2 plasmid-based reverse genetic techniques to generate recombinant viruses have revolutionized the influenza research field because specific questions have been answered by genetically engineered, infectious, recombinant influenza viruses. Such studies include virus replication, function of viral proteins, the contribution of specific mutations in viral proteins in viral replication and/or pathogenesis and, also, viral vectors using recombinant influenza viruses expressing foreign proteins 3. Influenza A virus belongs to the Orthomyxoviridae family of negative-stranded RNA enveloped viruses. The influenza A virus genome consists of eight different RNA genes of negative polarity that encode, at least, 11 viral proteins (Figure 1) 4. We will focus, in this report, on the rescue of one of the most common laboratory strain, influenza A/PR/8/34, 5 using ambisense plasmids (pDZ) containing the 8 influenza A/PR/8/34 viral segments (Figure 2). For the rescue of recombinant influenza viruses from plasmid DNA , we recommend 3 independent transfections per each recombinant virus. If more than one recombinant virus rescue is attempted, scale the following steps accordantly to the number of viruses to be rescued. The following transfection and infection protocol is established for 6-well-plates. A schematic representation of the protocol is illustrated in Figure 3. OptiMEM-Lipofectamine 2000 (LPF2000) mixture: Prepare 250 μl of OptiMEM media and 6-8 μl of LPF2000 per transfection. Incubate for 5-10 minutes at room temperature (RT). Meanwhile, prepare the plasmid transfection mixture. Plasmid transfection mixture: Prepare the plasmid transfection cocktail in 50 μl of OptiMEM media. We usually use 1 μg of each influenza DNA plasmid per rescue. Add 1 μl of the pDZ plasmids (at 1 μg/μl) PB2, PB1, PA, HA, NP, NA, M, and NS to a tube containing 50 μl of OptiMEM media. OptiMEM-LPF2000-DNA plasmid mixture: Add 250 μl from step 1.1 into the influenza DNA plasmid transfection mixture (step 1.2). Incubate this mixture for 20-30 minutes at RT. Meanwhile, prepare suspensions of 293T and MDCK cells for transfection. Preparation of 293T/MDCK co-culture: Before starting, bring the PBS 1X, DMEM 10%FBS 1% PS media, and EDTA-trypsin mixture to 37°C. The density of the cells should be at 80-90% confluence the day of transfection. Usually, one confluent 100 mm dish of 293T and one confluent 100 mm dish of MDCK cells can be used for 10-12 rescues. We are going to use 250 μl of cells per well. Both cell lines will be resuspended in a total of 3 ml of DMEM 10%FBS 1%PS. Carefully resuspend each cell line in 10 ml of DMEM 10%FBS 1%PS in a 15 ml centrifuge tube. You will have one tube for 293T cells and one tube for MDCK cells. Resuspend the 293T cells in 3 ml of DMEM 10%FBS 1%PS and when resuspended, deliver the 3 ml to the MDCK cells to resuspend those cells. This will give you the mixture of 293T and MDCK cells to be used for your co-culture. Add 250 μl of the 293T/MDCK cells per well (10-12 6-well wells). After 20-30 minutes RT incubation (step 1.3), add 1 ml of DMEM 10%FBS 1%PS to the OptiMEM-LPF2000-influenza DNA plasmid mixture. Add the 1.3 ml (step 1.5) into the wells with the 250 μl of 293T/MDCK cells (step 1.4). Gently shake the 6-well-plate and let the transfection incubate overnight (ON) in the incubator at 37°C and 5% CO2. Next day, approximately 16-24 hours post-transfection, change the transfection media and incubate the transfected cells in DMEM 0.3%BA 1%PS containing 1 μg/ml of TPCK-trypsin for 48 hours. After 48 hours of changing the media, transfer the supernatant from the transfected cells into a microcentrifuge tube. Centrifuge the tissue culture supernatant in a microcentrifuge for 1-2 minutes, 13,000 rpm. Infect fresh MDCK cells in 6-well plates (plated the day before) or 10-day-old chicken embryonated eggs with 200 μl of centrifuged tissue culture supernatants from step 1.10. Incubate the cells and/or eggs at 37°C for 2-3 days. Infection of 10-day-old chicken embryonated eggs: All procedures to infect chicken embryonated eggs are performed under sterile conditions. Candle the 10-day-old eggs using a light-candling box to see the interface between the air sac and the allantoic cavity. Make a pencil mark on the interface border. With a 5 ml syringe needle make a hole in the eggshell. With a 1 ml syringe, infect each egg with 200 μl of the tissue culture supernatants from step 1.10. Cover the hole in the eggshell with melted wax using a cotton swab. Incubate the infected eggs at 37οC for 2-3 days. Wash cells, twice, with 1 ml of PBS 1X. Infect with the 200 μl of centrifuged tissue culture supernatants for 1 hour at RT. Do not let the cells dry. Rock the 6-well-plate every 10 minutes. After 1 hour of viral absorption, remove the infection media from the MDCK cells and add 2 ml of DMEM 0.3%BA 1%PS containing 1 μg/ml of TPCK-trypsin. At 48-72 hours after passage, depending on the transfection efficiency and the virus load, a cytopathic effect (CPE) will be observed in the MDCK infected cells. CPE suggests a successful rescue. However, an HA assay (section 2) should still be performed to confirm the presence of the virus in the tissue culture supernatants. Harvest allantoic fluid from infected chicken embryonated eggs: All procedures to harvest the allantoic fluid from infected eggs are performed under sterile conditions. Approximately 8-12 ml of allantoic fluid can be harvested from each 10-day-old-infected egg. Prior to harvesting the allantoic fluid, incubate the chicken eggs for 2 hours (or ON) at 4°C to kill the chicken embryo and coagulate the blood. Wash the eggshells with 70% ethanol to establish sterile conditions. Open the egg, carefully, over the air cavity by tapping with a spoon. Remove the broken eggshell with the help of forceps. With a 1 ml needle, remove the allantoic membrane without breaking the egg's yolk. Stabilize the chicken embryo with a spatula as you guide a 10 ml pipette into the allantoic fluid. Collect as much allantoic fluid as possible into a 15 ml centrifuge tube on ice in an ice bucket without breaking or collecting any of the egg's yolk. Use a 15 ml centrifuge tube for each egg. Centrifuge for 5 minutes at 4°C and transfer the allantoic fluid (without taking pelleted red blood cells) to a fresh 15 ml centrifuge tubes. Store the tubes containing the centrifuged allantoic fluid at 4°C until they are checked for the presence of rescued virus with a hemagglutination (HA) assay. Hemagglutination assay (HA) is routinely used to detect the presence of rescued virus in MDCK tissue culture supernatants and/or the allantoic fluid of harvested eggs. Alternatively, immunofluorescence assays (IFA) can be also performed. 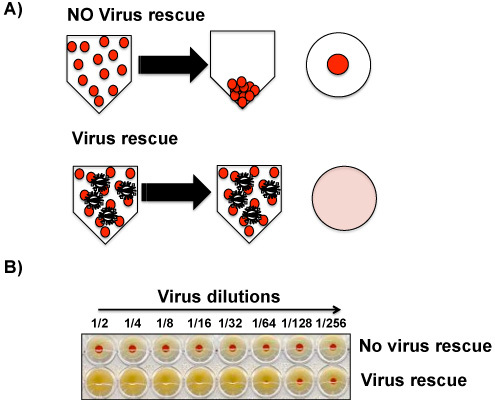 Once an assay identifies the presence of rescued virus, the virus should be plaque purified and the genetic composition of the virus will be confirmed by RT-PCR and sequencing. The presence of virus in the MDCK tissue culture supernatants and/or in the allantoic fluid from infected eggs can be determined macroscopically using HA of chicken (or another source) red blood cells (RBC). The presence of virus induces hemagglutination of RBC while the absence of virus allows the formation of a red pellet in the bottom of the well (Figure 4). In the case of influenza virus, it is believed that approximately 103-104 plaque forming units (PFU) are required to give a positive signal in the HA assay; therefore, an IFA can be performed in parallel with the HA assay to confirm a true negative result. IFA with primary anti-influenza antibodies is more sensitive than the HA assay because less than 103-104 viruses can be detected with this technique. It is possible than supernatants or allantoic fluids that are HA-negative are positive by IFA. In this case, the virus should be amplified by passaging, again, in MDCK cells or in eggs. Allantoic fluid and/or tissue culture supernatants from the second passage should now be clearly positive in the HA assay. HA assays are carried out in V-bottom 96-well plates. Negative (for instance, PBS 1X) and positive (tissue culture supernatants and/or allantoic fluid from an influenza virus infection) control samples should always be included in any HA assay to validate it. Dispense 50 μl of PBS 1X into each well of the V-bottom 96-well plate. Add 50 μl of the MDCK tissue culture supernatants and/or allantoic fluid from the infected eggs to the first well and, make 2-fold serial dilutions for the following wells. Discard the extra 50 μl from the last well. Add 50 μl of 0.5%-1.0% chicken red blood cells (prepared in PBS 1X) to each well. Incubate the V-bottom 96-well plate for 30-45 minutes (until a red dot is visible in the bottom of a negative control PBS sample) on ice. Read and interpretate the results as indicated in Figure 4. A negative result in the HA assay may be a result of low transfection efficiency with low levels of virus being present in the tissue culture supernatants and/or allantoic fluid. Passage of these samples in fresh MDCK and/or embryonated eggs will allow amplification of the virus (as indicated in Figure 3) Infections are performed as previously described in section 1.11.2. Successful influenza virus rescue will be confirmed by the presence of a positive HA assay (Figure 4). Additionally, the existence of CPE in cells infected with the tissue culture supernatants or with the allantoic fluid from eggs will suggest a positive viral rescue. Figure 1. Influenza Virus structure: Influenza virus is surrounded by a lipid bilayer containing the two viral glycoproteins (HA, NA) and, also, the ion channel protein, M2. HA is the viral attachment protein, responsible for binding to sialic acid-containing receptors. NA is responsible for viral release from host cells. Underneath the lipid bilayer, is a protein layer composed of the inner surface envelope matrix protein 1, M1, which plays a role in virion assembly and budding and the nuclear exporting protein (NEP), required for nuclear export of viral ribonucleocapsids. The core of the virus is made of a ribonucleoprotein (RNP) complex, composed of 8 single-stranded negative RNA viral genes encapsidated by the viral nucleoprotein, NP. Associated with the RNP complex are the viral RNA-dependent RNA polymerase subunits PA, PB1, and PB2. The non-structural proteins NS1 and PB1-F2, encoded by the RNA segments NS and PB1, respectively, are not part of the virion structure. Figure 2. Influenza virus rescue plasmids: The eight influenza virus genes cloned into the ambisense plasmid pDZ are indicated. pDZ plasmid 6, derived from the protein expression plasmid pCAGGs 7, is a bidirectional plasmid vector with a human RNA polymerase I promoter and a mouse terminator sequence that encodes the negative sense genomic RNA; in opposite orientation to the polymerase I unite, a polymerase II transcription cassette (chicken β-actin promoter and polyA) encodes the viral proteins from the same viral gene. cDNAs from each viral segment are generated by RT-PCR with forward and reverse primers containing the SapI restriction endonuclease site and the noncoding regions of each segment (black boxes at the end of the viral genes). The PCR product is cloned into the pDZ digested with Sap-I. Figure 3. 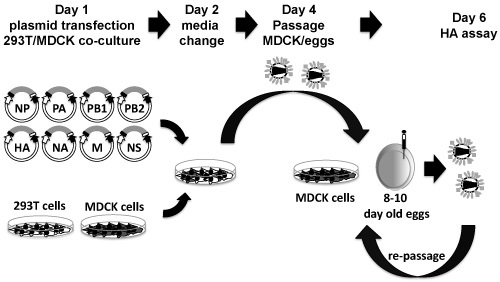 Eight-plasmid-based influenza rescue system: pDZ plasmids containing the 8 influenza viral genes are co-transfected, in suspension, in 293T-MDCK cells co-cultures (day 1). Twenty-four hours post-transfection, media without FBS but containing TPCK/trypsin is replaced (day 2). Forty-eight hours after changing media, tissue culture supernatant is harvested and used to infect MDCK or 10-day-old embryonated chicken eggs (day 4). 48-72 hours post-amplification, tissue culture supernatants from MDCK infected cells or allantoic fluid from eggs are harvested and assayed for presence of virus by HA (day 6). If no virus is detected, the same supernatants and/or allantoic fluids can be re-passaged into fresh MDCK cells and/or embryonated eggs. Figure 4. Hemagglutinin assay (HA): Hemagglutination of RBC by virus particle is visible macroscopically and is the basis to detect viral particles in tissue culture supernatants or/and allantoic fluids. Although the HA assay does not discriminate between viral particles that are infectious and particles that are degraded and no longer able to infect cells, the assay is a good indicator of presence of virus in samples. A) Absence (top) of presence (bottom) of virus in the biological samples is determined by presence of RBC in the bottom of the plate or their absence, respectively. B) A representative result from an HA assay with no detectable levels of virus (top) or presence (bottom) of virus is shown. Rescue of recombinant influenza viruses from plasmid DNA is a simple and straightforward process once the protocol is routinely performed in the laboratory, but in the beginning, multiple things can go wrong. It is imperative to have good plasmid preparation to generate the virus. Proper maintenance of the cell lines (293T and MDCK) is crucial for a successful viral rescue. Traditionally, a genetic tag is inserted into an influenza gene-encoding plasmid, by silent mutagenesis. Introduction of this silent mutation(s) and creation of, for instance, a novel restriction enzyme site is used to distinguish between wild-type and recombinant influenza virus by enzyme digestion. Therefore, after amplification of the plaque purified recombinant virus, RT-PCR and sequencing approaches should be performed to verify the nature of the rescued virus. The development of these reverse genetics techniques and successful rescue of recombinant influenza viruses from plasmids will allow you to answer specific questions about the biology of the virus. Mount Sinai School of Medicine has intellectual property rights in the area of recombinant influenza viruses, and AG-S is an inventor in this intellectual property. The authors want to thank past and present members in the Adolfo García-Sastre and Peter Palese laboratories for the development of influenza reverse genetics techniques and plasmids. Research in AG-S laboratories is partially funded by CRIP, an NIAID-funded Center of Excellence for Influenza Research and Surveillance (HHSN266200700010C) and by NIAD grants R01AI046954, U01AI070469 and P01AI058113. Research in LM-S laboratory is partially funded by NIAID grant RO1AI077719. Embryonated 10-day-old chicken eggs can be obtained from Charles River Laboratories, Specific Pathogen Fee Avian Supply (SPAFAS) Avian Products and Services. Franklin Commons, 106 Route 32, North Franklin, CT 06254 USA. Eggs are incubated at 37°C preceding and after viral infection. Before and after viral infection, eggs are candled to determine viability of the embryos. It is very important to look for dead eggs before and after viral infection. Before infection a dead egg can be easily spotted by the absence of blood vessels as well as the absence of embryo mobility. When candled, live embryos move. After viral infection a dead egg (probably related to influenza virus infection) will be easily spotted by the bad appearance of the egg as seen by the smaller and bloody volume of allantoic fluid. Infected-eggs are discarded in double autoclavable bags and autoclaved following standard procedures. Chicken RBC can be purchased from Truslow Farms, 201 Valley Road, Chestertown, Md 21620. Store at 4°C. For HA assays, wash 5 ml of the chicken RBC with 45 ml of PBS 1X in a 50 ml centrifuge tube. Centrifuge for 5 minutes at 1000 rpms, RT. Discard carefully the supernatant and use a 1:1000 dilution of the pelleted RBC in PBS 1X (final concentration of 0.5-1.0% RBC). Both, tissue culture supernatants and allantoic fluids can be stored at 4°C for a short period of time. After confirming virus rescue, viruses from cell supernatants or allantoic fluid are stored at -80°C. All plasmids are prepared using a plasmid maxi kit following manufacturer’s recommendations. All plasmids are aliquot at concentrations of 1 μg/ml in ddH2O and stored at -20°C. For short-term storage, the plasmid can be keep at 4°C. The concentration of the purified DNA plasmid is determined by spectrophotometry at 260 nm, with purity being estimated using the 260:280 nm ratio. Preparations with 1.8-2.0 260:280 nm ratios are considered appropriated for virus rescue purposes. Additionally, plasmid concentration and purity should be confirmed with agarose gel chromatography. Ambisense pDZ plasmids (6) containing the eight influenza A/PR/8/34 viral genes (7) are illustrated in Figure 2. The described protocol for rescuing influenza A/PR/8/34 can be performed under biosafety level (BSL) 2 conditions. Contaminated material, including tissue culture supernatants and embryonated eggs, should be sterilized before disposal. Rescue of other influenza virus may require higher BSL conditions and, therefore, special conditions/security measurements will need to be followed. DMEM 10%FBS 1%PS: 445 ml Dulbecco’s modified Eagle’s medium (DMEM), 50 ml of Fetal Bovine Serum (FBS), and 5 ml of 100X Penicillin/Streptomycin (PS). Store at 4°C. This media will be used to maintain 293T and MDCK cells as well as for the transfections. DMEM 0.3%BA 1%PS: 495.7 ml of DMEM, 4.3 ml of 35% Bovine Albumin (BA). Store at 4°C. Just before use, add TPCK treated trypsin to a final concentration of 1 μg/ml. Infectious media. Neumann, G., Watanabe, T., Ito, H., Watanabe, S., Goto, H., Gao, P., Hughes, M., Perez, D. R., Donis, R., Hoffmann, E., Hobom, G., Kawaoka, Y. Generation of influenza A viruses entirely from cloned cDNAs. Proc Natl Acad Sci U S A. 96, 9345-9350 (1999). Fodor, E., Devenish, L., Engelhardt, O. G., Palese, P., Brownlee, G. G., Garcia-Sastre, A. Rescue of influenza A virus from recombinant DNA. J Virol. 73, 9679-9682 (1999). Martinez-Sobrido, L., Garcia-Sastre, A. Recombinant influenza virus vectors. Future Virology. 2, 401-416 (2007). Palese, P., Shaw, M. L. Orthomyxoviridae. The viruses and their replication. Fields Virology. Knipe, D. M., Howley, P. H. 5th Edition, Lippincott Williams & Wilkins. PA, USA. 1647-1689 (2006). 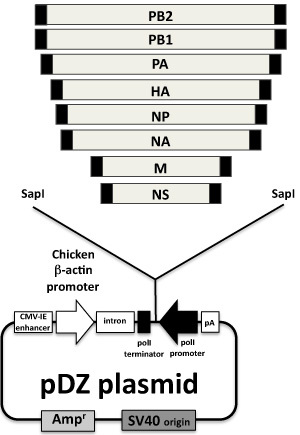 Schickli, J. H., Flandorfer, A., Nakaya, T., Martinez-Sobrido, L., Garcia-Sastre, A., Palese, P. Plasmid-only rescue of influenza A virus vaccine candidates. Philos Trans R Soc Lond B Biol Sci. 356, 1965-1973 (2001). 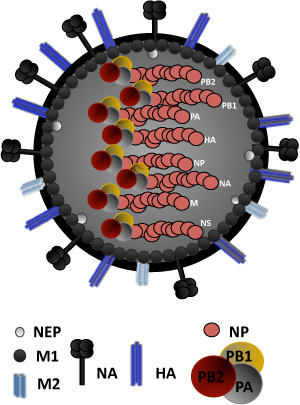 Quinlivan, M., Zamarin, D., Garcia-Sastre, A., Cullinane, A., Chambers, T., Palese, P. Attenuation of equine influenza viruses through truncations of the NS1 protein. J Virol. 79, 8431-8439 (2005). The PDF of this article is not possible to download, gives some syntex error. Please make it fixed. Yes it is like this. Please correct it. Our apologies. This has been fixed.